Many thanks to all who braved the heat & the crowds for another great Anime Expo! MANY thanks to the 1,500 of you who visited the WONDERLENS booth and played our ping pong toss game, thus forcing us to chase after 4500 cursed ping pong balls! Here’s just one of the highly skilled anime fans who won a DVD! Cosplay and Ping Pong Throwing! So what’s to do now that AX2003 is over? Why not stop by the ROBOT CANTINA and help solve the MYSTERY of ASTRAL GEODE! It’s a mystery set inside a robot’s blog. New clues are added each day, Monday – Friday. 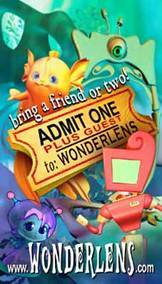 Or visit the WONDERLENS ATTRACTIONS and download some animation. AND collect some free PRIZES & SURPRISES ! More good Anime Expo News! $20 for the SIGNED, Limited Edition Collector’s Bundle. This special set includes the Wonderlens animated DVD, SIGNED by the show’s creators, (Jimmy Neutron, Addams Family, Casper, Kung Pow, Thumb Wars & more!) a limited edition (250 maximum) character model sheet SIGNED by the artist, plus toys & surprises! Show price valid through AUGUST 2003, as supplies last. for info on how to order! NEW WORLDS of FUN on DVD! SIX people threw wining ping-pong balls into the Sentry’s Eye and won DVDs! EIGHTEEN people threw winning balls into the cup and won Mardi Gras beads. THREE winners were chosen for the WIN-a-DVD drawing and have been notified by email. Congratulations to all the winners & many thanks to all who played!